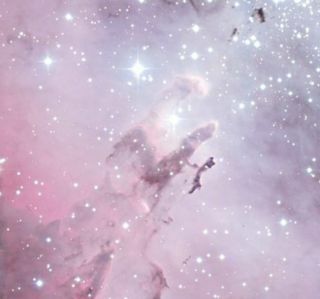 A close-up image of the the so-called “Pillars of Creation” located at the center of the Eagle Nebula. In 1995, the Hubble Space Telescope captured anunforgettable image of stars being formed that would later be known as the?pillars of creation.? Now newly released photos from the European SouthernObservatory's telescope at La Silla, Chile offer a second look with 200 timesmore detail than the original.? The Eagle Nebula, a region of space where the phenomenonoccurred, was discovered by Swiss astronomer Jean Philippe Loys de Ch?seauxaround 1745 near the constellation of Serpens (the Snake), some 7,000light-years away. The nebula itself has a shape vaguely reminiscent of aneagle, with the central pillars being the ?talons?. In the middle of the nebula, the pillars of gas and dust aresimultaneously sculpted, illuminated and destroyed by ultraviolet light frommassive stars in NGC 6611, an adjacent young stellar cluster. And within a few million years, they will be gone forever,astronomers say.